45 years ago today—on July 16, 1969—astronauts Neil Armstrong, Buzz Aldrin, and Michael Collins launched to the Moon on top of the mightiest spaceship ever built. These amazing photos from NASA's vaults show how they built and launched that spaceship—I look at them in awe and admiration. It was the most important trip in the history of humankind, a trip that many deemed impossible—some people still do think it's impossible—an odyssey that started many years before and changed our perception of the world itself. Only eight years before this day—on on May 25, 1961—Kennedy announced a plan to go to the Moom. It was a plan that they didn't have. In fact, the mere idea was one that almost everyone thought was impossible to do in that timeframe. Just think about this: The United States only launched its first man to space on May 5, 1961—and he didn't even orbited the Earth. That happened after Kennedy's announcement, on February 20, 1962. And yet, they did it. The United States was fighting against all odds to beat the Soviet Union on the race to the Moon. The effort turned the country into a technological powerhouse like no other in the world, catapulting it decades ahead of everyone else, with more engineering students getting out of college than ever with the sole intention of participating in the greatest, most amazing project ever imagined. Enjoy these images of an era long gone. March 21, 1969. The instrument unit for the Saturn V launch vehicle, AS-506, used to propel the Apollo 11 lunar landing mission, is lowered into place atop the third (S-IVB) stage in the vehicle assembly building at the NASA Kennedy Space Center (KSC). The final assembly stacking of Command Module at the North American plant, Tulsa, Oklahoma. The command and service modules for Apollo 11 are installed in the altitude chamber of the Manned Spacecraft Operations Building at NASA's Spaceport. May 20, 1969. 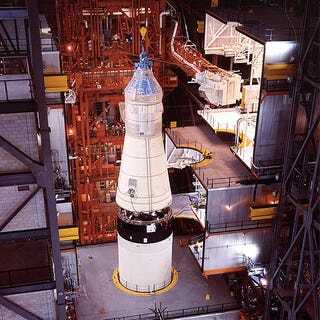 Apollo 11 CM / Saturn stack on rollout day. May 20, 1969. Carrying the 363-foot-high Apollo 11 Saturn V rocket and mobile launcher, the crawler inches out of the Vehicle Assembly Building on the journey to Launch Pad 39A. Pad Leader Guenter Wendt, kneeling, supervises the egress of Apollo 11 crews from spacecraft following a countdown demonstration test. Visible in hatchway is Command Module Pilot Michael Collins. 16 July, 1969. The crew of the Apollo 11 lunar landing mission arrives atop Pad A, Launch Complex 39, Kennedy Space Center, during the Apollo 11 prelaunch countdown. Leading is astronaut Neil A. Armstrong, commander. He was followed by astronaut Michael Collins, command module pilot. Technician follows directly behind Armstrong and Collins. Apollo 11 as viewed from an Air Force EC-135N plane. A 70mm Airborne Lightweight Optical Tracking System (ALOTS) camera took this picture. ALOTS tracking camera mounted on an Air Force EC-135 aircraft flying at about 40,000 feet altitude photographed this event in the early moments of the Apollo 11 launch. Separation of the first stage. The mated Apollo spacecraft and Saturn V second (S-II) and third (S-IVB) stages pull away from the expended first (S-1C) stage. Separation occurred at an altitude of about 38 miles, some 55 miles downrange from Cape Kennedy.